Consider the ideal working conditions for a chef, and Randy Weed has it all: Recipe development responsibility, gigantic pantry full of top-quality ingredients, and satisfied, often repeat customers. The twist is that Weed wields his talents in the kitchen of an upscale grocery store, rather than a restaurant. 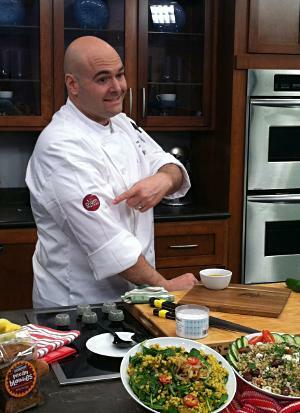 The 1996 NMC culinary graduate is the vice president of culinary at Plum Market, an upscale retail grocer with six locations in metro Detroit and Chicago. Weed’s career path illustrates the options available to current Great Lakes Culinary Institute students, who on Feb. 24 will host A Taste of Success, a strolling dinner of international cuisines and the program’s biggest scholarship fundraiser. “When I started out in this career, the last place I ever wanted to work was a grocery store,” said Weed. But he’s found his passion for food, kindled at NMC by instructors like the late Lucy House and Pete Peterson, is stoked daily at Plum. “My goal has always been to have the highest quality food we can get. 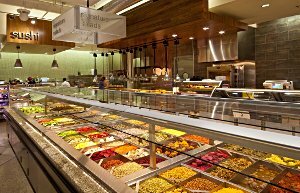 There is no better pantry than what I could access here,” said Weed, who supervises eight other chefs and creates the recipes served up at six different stations in the store, from an all-organic salad bar to a hot bar to a carving station whose all-natural meat entrees change themes daily, from Asian to chophouse to Latin. Plum also offers in-store cafes and catering. He would know. As a student, Weed did an internship at Tapawingo, Peterson’s legendary restaurant in Ellsworth, which closed in 2009. He later worked at other high-end northern Michigan restaurants including Latitude in Bay Harbor and the Garland Resort & Country Club east of Gaylord. After moving downstate, he cooked in top-tier restaurants including the now-closed Golden Mushroom and Roast in Detroit. The interior of a Plum Market storeHe’s thrilled to have landed at Plum, which has doubled its locations since he joined the company seven years ago. Besides his daily kitchen duties, Weed enjoys tasks like last year’s trip to Spain, to develop a partnership with the world’s largest purveyor of Spanish olive oil. “Everything I learned at NMC and all the different experiences prepared me for it,” he said. Weed’s advice to current culinary students? And remember that even with a VP in your title, certain tasks in the kitchen always need to be done. Tickets to A Taste of Success are $100 each. Sponsor tables are also available. Buy online and support culinary student success.